We were merely strolling up and down Main Street in this quirky little town, looking for a restaurant. Every cafe or eatery that we tried was closed. AT least we got to stretch our legs after the long 2 hour drive from home, and at least we got to see the Cat-n-Around cats of Catskill, a uniquely artistic venture in the area. But we were hungry and thirsty and could find no where to lay our heads, lol. Passing by a store front, something caught my eye. This artifact was found among others, in a chipmunk borrow [sic] in Greene County. 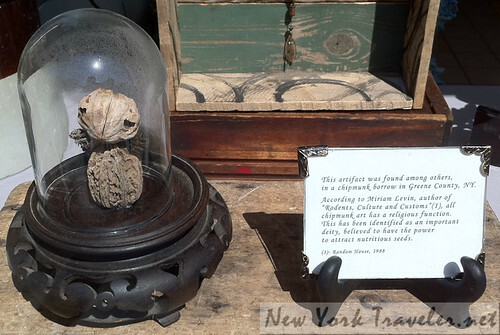 According to Miriam Levin, author of “Rodents, Culture and Customs” (1), all chipmunk art has a religious function. This has been identified as an important deity, believed to have the power to attract nutritious seeds. When the moon was young she used to smoke this pipe. 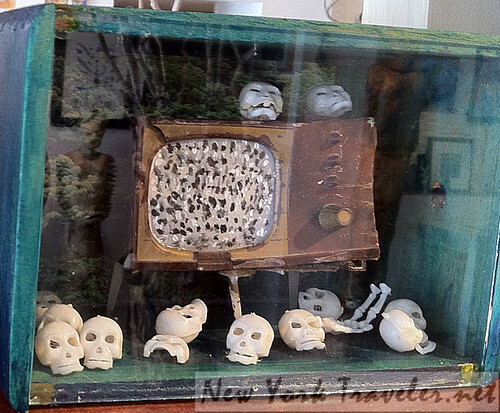 The place is like a little museum of quirky works of art. The art is not my style (I prefer more formal, classical pieces), but the placards with the artwork was delightfully humorous! I love it! 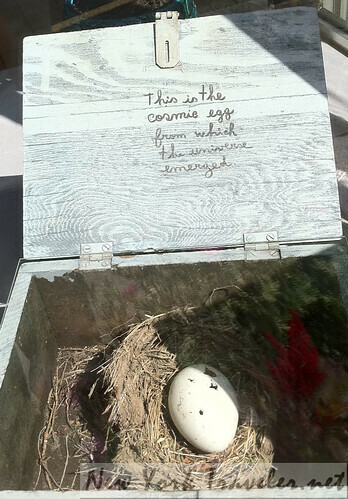 This is the cosmic egg from which the universe emerged. 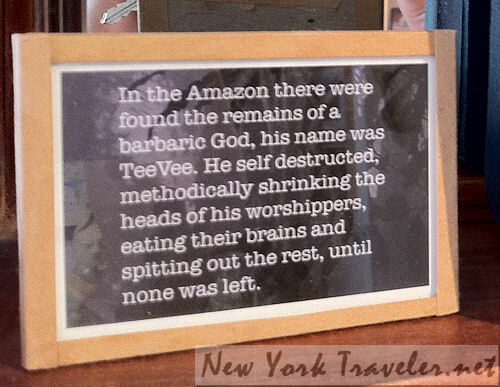 In the Amazon there were found the remains of a barbaric god, his name was TeeVee. He self destructed, methodically shrinking the heads of his worshippers, eating their brains and pitting out the rest, until none was left. 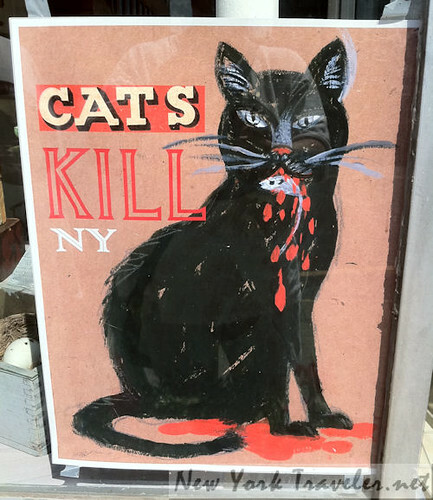 The studio is run by artist Dina Bursztyn, an artist originally from Argentina but living in New York City and now Catskill, NY, since 1976. She received the attention of The New York Times in a review of her work here www.nytimes.com/2004/05/09/nyregion/art-review-artifacts-with-a-modern-appeal.html. 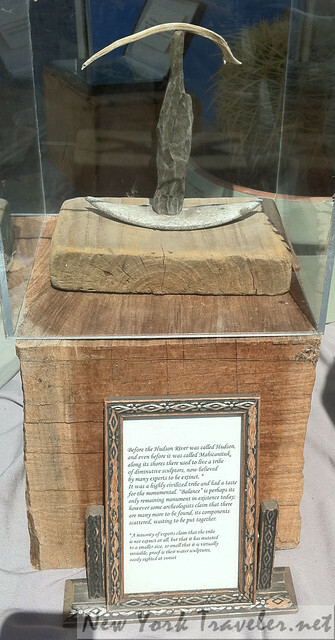 Before the Hudson was called Hudson, and even before it was called Mahicanituk, along its shores there used to live a tribe of diminutive sculptors, now believed by many experts to be extinct. * It was a highly civilized tribe and had a taste for the monumental. “Balance” is perhaps its only remaining monument in existence today; however some archeologists claim that there are many more to be found, its components scattered, waiting to be put together. * A minority of experts claim that the tribe is not extinct at all, but that it has mutated to a smaller size, so small that it is virtually invisible; proof is their water sculptures, easily sighted at sunset.